Todoriki Valley (等々力渓谷, todorokikeikoku) is located in Setagaya, Tokyo. It goes 1 km with Yazawa river. This is the only Valley in Tokyo Metropolis and has about 10m high. There are many trees, flowers, fishes and wild birds. Not like other nature of Tokyo Downtown which is mostly artificial nature, the nature of Todoroki valley is the real nature preserved for long time. 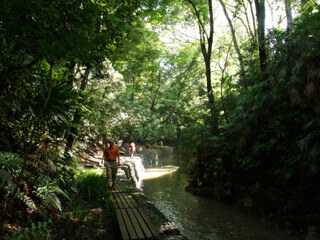 In the valley, there are many water springs and even small waterfall at Todoroki Temple. This valley is chosen as one of the place of scenery in Tokyo, and one of the best place for walking, especially in summer. There are no parking, but there is restroom. On the weekend, many people visit this valley and enjoy walking. Check out the Todoroki Valley. It is the real valley in Tokyo downtown. It is about 1 km longs from Todoroki Station to Tama River. You will surprise that kind of beautiful nature was actually existed in Tokyo downtown. There are many trees and flowers. You can also enjoy watching wild birds and fishes in this valley. The valley crosses the Kanpachi highway which is the one of the major street in Tokyo. Many people enjoy visiting here to feel cool air with lots of green and water of the river. If you are getting little tired of many artificial buildings and human's noise. Come and visit Todoroki Valley. There is also ancient tomb in the valley. The researchers estimate this tomb was build about 1300 years ago. At the Todoroki Fudo temple, there is the small waterfall which is once and still used for training for disciplinant.